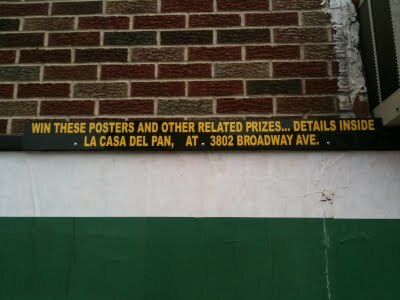 The above image shows the newest version of the contest promotion placards placed on all NPA Outdoor illegal advertising locations in NYC. I'm not a lawyer, but I'm assuming they are doing this to convert these signs from illegal third party signs into legal first party signs. By this logic, the posters on the giant billboards are not advertisements but merely a display of goods available inside. 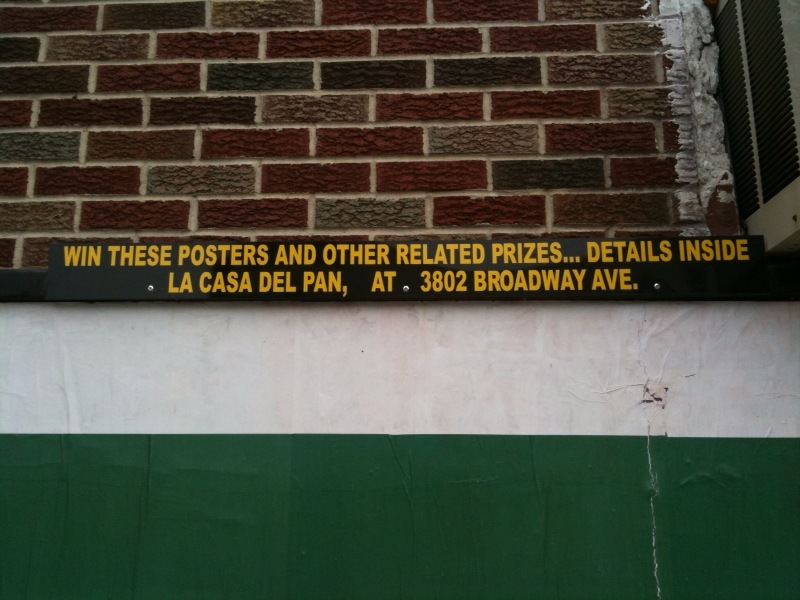 In this case, La Casa Del Pan (The House Of Bread) is now in the business of giving away free adverts and allowing you to enroll in contests in which you can win more adverts. For this service, they are paid $50.00 a month by NPA. Amazing! Now this is just shameful subversion of the law and I don't think it really holds water. One would have to be able to argue that the advertising posters are an actual good or service being provided, (by La Casa Del Pan) and not just some obscene ruse cooked up by well paid lawyers and greedy outdoor advertising corporations to outsmart the city. The one nice thing about this new system is that it makes gathering the exact addresses where permits should, but don't, exist for all NPA Outdoor illegal signage. 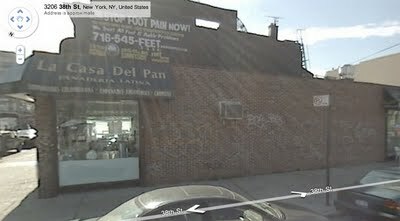 For example at 3802 Broadway Avenue in Queens, of the six permits shown the Department of Buildings website, no permits for advertising signage exist. Oddly enough the Google Maps Streetview doesn't show an NPA sign. Must have been put up very recently.